Tropical Storm Chris forms, Debby by the weekend? The 2012 Atlantic Hurricane season continues to crank out northern Atlantic named storms…today with the formation of Tropical Storm Chris. Over the last five days or so, a low pressure system moved away from the southeastern US as a weak frontal system. It passed north of Bermuda, and began to shed its frontal nature yesterday. Late yesterday, designated invest 95L looked like it was going to dissipate during this divorce. It slowly worked its way back and regrew a few thunderstorms and became more symmetric. This afternoon 95L became Tropical Storm Chris. Below is the 18z FSU Cyclone Phase Diagram that shows Chris’ history as well as a slow transition to a moderate, symmetric small warm core system. The National Hurricane Center shows some moderate intensification from 45 mph up to about 50 mph in about 48 hours. As of 11pm, Chris retains a pressure of 1005 mb. 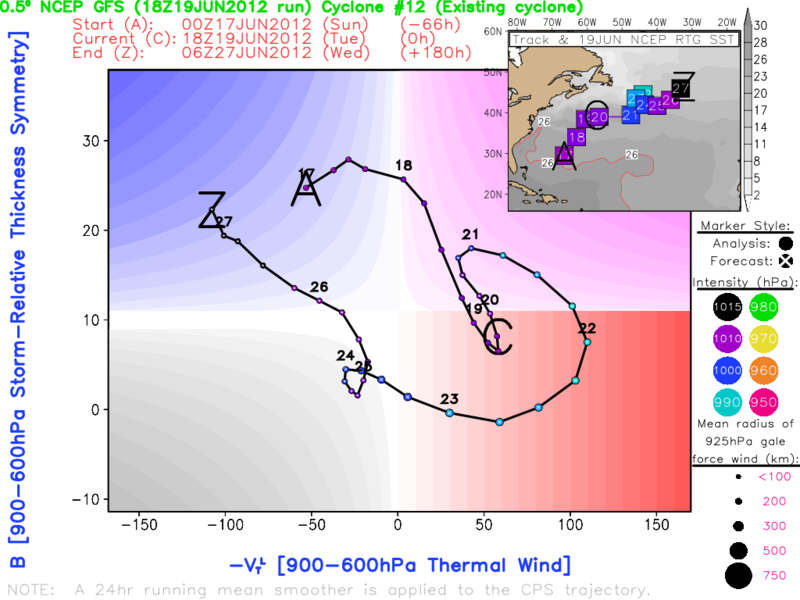 They expect Chris to transition to post-tropical before that peak in intensity occurs however. The Canadian Hurricane Centre may get in on the act late tomorrow with forecasts as Chris is expected to move to the north possibly toward Newfoundland over the weekend. I expect no landfall, but gusty winds and high waves are possible in maritime Canada over the weekend and early next week. Climatology of Chris: According to Mike Adcock, the formation of the “C” Storm comes 53 days ahead of climatology and the earliest “C” storm on record. Neither of these statements may be used as predictors on the rest of the season. What interests me more here in Florida is the possibility of another cyclone growing in the Gulf during the weekend or early next week. Let me stress, this will NOT be a strong storm and it may not even get a name! What does raise the hairs on the back of my neck is the thought of resurrecting the ark I buried in my backyard a week or two ago, and according to a couple of the models, we may have to do just that. The Hydrological Prediction Center QPF product is currently forecasting more than 7″ of rain for much of the lower Keys, and that is only up to 00z Monday, or late Tuesday evening. I’ll get into the prospects of heavy rain over the next couple of days. The models: At this point model consensus is barely in existence. We have two problems to deal with at this point early on in the game. Firstly, the models do not have a point to latch onto, which in itself created model chaos. I think that the NHC will designate an area of investigation at some point tomorrow, which will allow the models something to latch onto, and lower the amount of chaos. Secondly, there is a slow moving trof that is progged to sneak down into the eastern USA on Sunday or Monday. An omega blocking pattern will slow things down in the upper part of the atmosphere as we head into the weekend, and it will be tricky to see exactly when the trof comes down and how strong it will be. This is the feature that will pick up the storm and move it out of the Gulf and across Florida. If the trof is slower to move in, the storm will get stuck in the Gulf and could move farther north. In the short term: With this low pressure center building and a strong Bermuda high in place in the western atlantic, a battle between the two will begin tomorrow morning that will be centered along I-4. The pressure gradient will tighten through tomorrow night, and winds could increase to 20 mph in some areas with gusts to 30 mph. It will be a gusty day for most Floridians tomorrow, and a rainy day for south Florida. Precipitation will advect in, or move in, from the Florida Straights throughout the night, and will slowly raise rain chances through tomorrow across the Glades and the metros of south Florida. Rain chances south of the Alley are 90%, 70% south of the lake, and 50% south of I-4. The cloud shield that kept temperatures down a degree or two today will thicken and push north tomorrow. Last weekend I was in Fort Lauderdale, and I was able to go to the Broward County Emergency Operations Center in Plantation and I was able to talk to the folks there who prepare and respond to all disasters, natural or not in Broward County. I’ll share the details of my visit the next time the tropics calm down. While on the same trip, I attempted to make a video forecast to detail Florida weather. It was about six minutes long, and the video itself was well done, however the upload was a disaster. I was working with hotel wifi, which would have caused the upload to take more than 12 hours. Of course that is no good, but I do want to make another attempt in the future to vary up how you see the weather. Posted on Tuesday, June 19th, 2012, in Florida Weather, Tropical Weather. Bookmark the permalink. 2 Comments. I like the valuable info you provide in your articles. I will bookmark your weblog and take a look at once more here frequently. I am rather certain I will be informed many new stuff proper right here! Good luck for the following!